Siyani Chambers (left) and Laurent Rivard celebrate Harvard’s first NCAA Tournament victory, a 68-62 decision over third-seeded NewMexico. SALT LAKE CITY --- Strains of “10,000 Men of Harvard” seemed to resonate all the way from Harvard Square to the cavernous EnergySolutions Arena where the Harvard men’s basketball team bounded off the court Thursday night to the tune of their first ever NCAA Tournament victory in school history. Making their second consecutive NCAA appearance, and third overall in school history, the 14th-seeded Crimson overcame a glaring size disadvantage to knock off third-seeded New Mexico, 68-62, in the second round of the NCAA West Region, eliminating the Lobos who were picked as favorites by some pundits to reach the Final Four. “It’s just incredible,” Wesley Saunders said of Harvard’s milestone triumph after he led the Crimson (20-9) with a team-high 18 points on 5-for-8 shooting, making 8 of 9 from the foul line. “This is the type of thing you dream about in your backyard playing around and imagining this situation happening. I mean, just for it to actually happen now is incredible. Here’s what lies ahead for the Crimson after their first-ever win in the NCAA Tournament. Harvard (20-9) will now rely upon their Ivy League scheduling to help them make a quick turnaround when they face sixth-seeded Arizona, an 81-61 winner over Belmont, Saturday at 6:10 p.m.
New Mexico, which had won nine times this season in Mountain West play after failing to shoot better than 40 percent, wound up struggling from the field after shooting 37.5 percent, getting a combined 17 points (5-for-21) from its backcourt trio of Tony Snell (9 points), Kendall Williams (8) and Hugh Greenwood (0 points). “I thought Harvard did a great job, and I want to commend Tommy and his staff and their players,” said New Mexico coach Steve Alford. “They played extremely hard and they made shots. We’ve dodged this bullet a lot this year by having bad shooting nights and still able to get wins. Undaunted by the physical mismatch posed by New Mexico’s imposing frontcourt, led by 7-foot sophomore center Alex Kirk, who had a double-double of 22 points and 12 rebounds, the Crimson received some inspired play from 6-8 sophomore Kenyatta Smith, who refused to back down to Kirk in the low post even after picking up four personal fouls. Smith, who departed the game with 15:29 to go, returned with 6:58 left and submitted an inspired effort down the stretch before he fouled out with 49 seconds to go and finished with 10 points, 7 rebounds and 2 blocked shots. Despite being outscored in the paint, 30-20, Harvard matched the Lobos point for point in the paint, each team scoring 14 in the first half, which gave the Crimson a fighting chance in the second half. New Mexico seemed committed to pounding the ball inside, almost neutralizing its guards until Snell gave the Lobos their first lead of game, 33-31, at 18:46 on a driving layup. 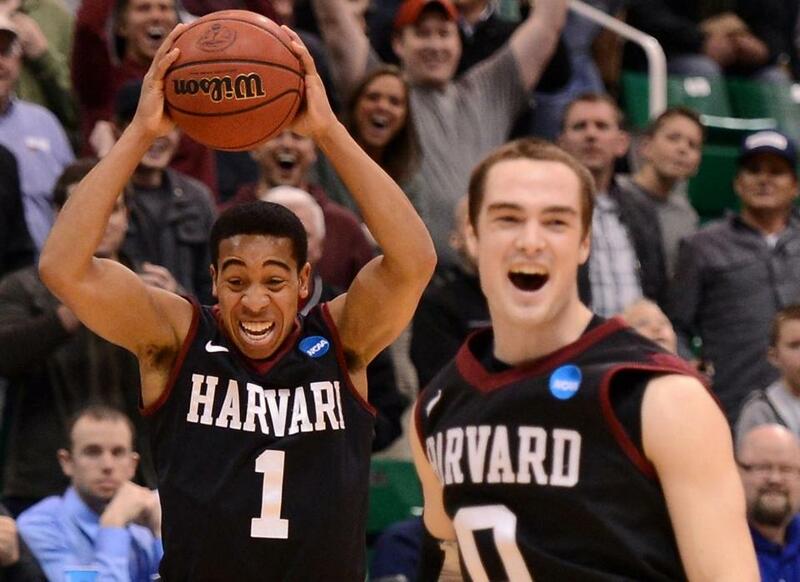 But Harvard responded by getting a pair of huge treys from Webster and Rivard to take a 37-33 lead. Smith made it 39-33 when he tallied on a strong post move over Kirk, but wound up departing the game when committed his fourth personal which sent Kirk to the line for a pair of foul shots that cut Harvard’s lead to 39-37 with 15:29 to go. Webster repelled the threat with a jumper for a 41-37 lead, but Kirk followed with another low-post basket to pull the Lobos within 41-39. A pair of foul shots by Saunders (courtesy of Williams’ third personal) gave the Crimson a 4-point edge, 43-39, but Snell whittled it 43-41 with his jumper with 12:43 to go. Just as Amaker had feared, the game started to turn for the Lobos when Harvard’s frontcourt got into foul trouble, with Travis joining Smith on the bench after picking up his fourth personal with 8:37 to go. Bairstow hit both foul shots to pull New Mexico within 47-46. Fenton, who missed an opportunity to put the Lobos ahead when he failed to convert a breakaway basket, atoned for his offensive miscue with a 3-point burial that gave New Mexico a 49-47 lead with 7:50 to go. Rivard went to the line for three foul shots and a chance to give Harvard the lead, but converted only the first and last attempts to make it 49-49. After Kirk hit a pair of foul shots to put the Lobos ahead, 51-49, Saunders answered with a foul-inducing scoop to give Harvard a 52-51 lead. After Kirk powered his way into the paint for another basket, Rivard answered by hitting a huge trey for a 55-53 Harvard lead with 6:06 left. Playing with four fouls, Smith returned to the game with 5:07 left and made his presence felt when he followed a Saunders jumper with a jump hook that increased Harvard’s lead to 59-53. Kirk cut it to 59-55 with his offensive putback, but drew his third personal which put Smith on the line for a pair of foul shots that extended Harvard’s lead to 61-55 with 3:03 left. Chambers hit a lane jumper to give the Crimson their biggest lead of the game, 63-55, before Fenton trimmed it to 63-58 with his 3-pointer with 1:30 left. Kirk committed his fourth foul with 55.2 seconds to put Moundou-Missi on the line for two foul shots. Moundou-Missi made the second attempt to give the Crimson a 64-58 buffer they needed in the final 49 seconds to clinch their historic NCAA triumph.